Following a call for submissions, the Canada’s First World War series on ActiveHistory.ca began with a post by Nathan Smith in August 2014 – exactly a century after the outbreak of the Great War. Since that time, the series has posted 40 pieces, including this one. The posts cover topics ranging from present-day commemorative efforts to actresses’ wartime work. You can see a list of these posts via the widget on the Active History main page. On the occasion of the second anniversary of launching our series, this post reflects on how it has evolved thus far, and some of the odd parallels we are encountering between the series and the Great War itself. The image we used in our Call for Blog Posts, two years ago, is Harold H. Piffard’s His Constant Companion. It first appeared in Canada in Khaki, No. 2. (London: The Pictorial Newspaper Co. for the Canadian War Records Office, 1917). At its outset, the series began as a platform from which to present alternative perspectives on the First World War, its legacy, and its commemoration. A pressing issue was to avoid the usual deluge of patriotic sentiment surrounding any military commemoration, and instead expand the focus beyond nationalistic parables and situate it within a more global context. Ironically, that would also come to mean acknowledging the many individual stories, each unique and nuanced, traditionally subsumed by national narratives. Ultimately, too, we wanted to remind Canadians of aspects of the war that were either forgotten, ignored or buried, and expand the Canadian story into areas often given short shrift. To date, the series has touched on a wide variety of subjects. Reflecting its special interest in questions of memory and commemoration, articles reflecting those themes comprise the largest proportion of posts (a little less than one-third). The rest are divided between many categories: between three and five posts each focus primarily on combatants, women, poetry/art, the home front, politics/ideologies, and race/ethnicity. The remainder (one or two posts each) cover the economy, voluntary organizations, military medicine, veterans, food/economy, conscientious objectors, or Canada’s relationship with the United States. The centennial of the war’s outbreak generated several early posts, and at least two posts were inspired by current affairs. Although several students, a number of amateur historians and at least one retiree have contributed to the series, up to this point the principal contributors have fallen into what might loosely be considered early-to mid-career stage historians. These are scholars who are actively researching First World War topics and/or exploring another academic interest that fits within the themes of this project . The poster we prepared last year. We are committed to seeing through the entire centenary, which means another two years. At the two-year point, however, we find that our initial flood of contributions has slowed to a trickle… echoes of First World War enlistment rates, anyone? This echo is interesting to consider. After a so-called “rush to the colours,” enlistment rates in Canada dipped and then declined precipitously during 1916. It is a fair generalization to say these early enlistees were more invested in the conflict overseas than most Canadians: the majority were British-born immigrants, and some had previous military experience. 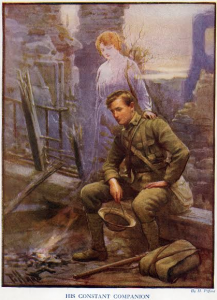 In a recent email exchange among ourselves on the question of how to attract further contributions, one of the co-editors wrote something to the effect of “I think we’ve gotten all the easy ones” – meaning work from people invested in First World War history. Surely some recruiting officer or Cabinet minister said something similar back in 1916? Among the strategies we’ve discussed for finding new posts are partnering with instructors to create more student submissions, and specifically inviting (begging?) senior scholars to write on specific topics. In other words, turning to older generations and those freshly coming-of-age, to hold the line. As we discussed these options, we could not help but be struck, once again, by the parallels to wartime recruitment. If there was a height requirement for contributors, we would lower it, as officials did to broaden the eligibility pool. Would we resort to conscription to fill our posting slots? Now there’s a controversial question! Kidding aside, it is nevertheless a brilliant little “living history” experiment to feel, in real-time, a century later, just how long four years is, in practical terms. Even we editors, keen as we are to see the series continue from strength to strength, have seen our energy and enthusiasm wane at times over the past six months, as Canadian support for the war effort did in 1916. Simply put, it is difficult to sustain a consistent level of effort and enthusiasm for two years straight. And as this work is voluntary, our challenge faintly mirrors the efforts of so many Canadians during the war, who worked in community organizations, and with national institutions such as the Red Cross, YMCA, or the Patriotic Fund. Imagine how it will feel in year four. Better yet, imagine how it felt when it was total war, and not just a series of blog posts. It is perhaps no surprise that in 1916, coupled with the decline in enlistment, operational strategy also underwent profound evolutions. The cessation of the disastrous Gallipoli Campaign in January, 1916, and the horrific battles of attrition at Verdun, and later the Somme—the last intended to alleviate pressure on the French at Verdun—meant British, German and French armies no longer could afford to simply throw everything they had into the breach and hope for a winning outcome. This, too, was largely our approach during the first two years of publications. We took what we had, and thrust it forth into the ether. Thus far, we are proud to say that unlike Falkenhayn, Foch or Haig, we have not had to contend with any casualties as the result of our efforts—except perhaps mild mourning for having challenged more than a few national myths. The point, of course, is that like the grand strategies of war, ours is one that is evolving, out of necessity if not remotely with the same sense of urgency. As we move into the next two years of our project, we have started looking ahead to the topics we hope to cover as we move forward. 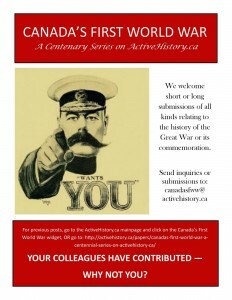 In the immediate future we are looking for submissions dealing with themes including; military recruiting and conscription, the effect of the long First World War on Canadian communities, the experience of wounded soldiers as they return to Canada and the growing role of women in industry and society. The centennial of particular events, like the destruction of the Royal Newfoundland Regiment at the Battle of the Somme, deserve attention too, and perhaps more so to compete with the attention that the hundred-year anniversary of the Battle of Vimy Ridge will garner. Traditional blog posts are great, but longer pieces, and graphic work is welcome too. We also think our series is a good place to discuss heritage and museum work about the war and its legacy. So to all those who feel they have something to contribute, we urge you to do your duty to your friends, family, community, country and empire by sending in your submission TODAY! Download our 2016 poster here: CFWW Poster 2016. 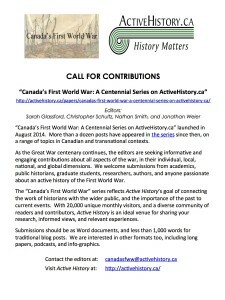 Mary Chaktsiris, Sarah Glassford, Nathan Smith, and Jonathan Weier are the co-editors of Canada’s First World War: A Centenary Series on ActiveHistory.ca. Christopher Schultz is a former series editor, who remains in a consultation role. While Chris ponders the next Big Push, new editor Mary Chaktsiris will bring fresh strategic vision to the day-to-day skirmishes and raids of the editorial battlefield.